ARTHUR MITCHELL—HARLEM’S BALLET TRAILBLAZER—curated by Lynn Garafola at the Wallach Art Gallery—features an extensive selection from Mitchell’s archive, as well as performance films from throughout his career as a dancer with the New York City Ballet through the founding and directorship of the Dance Theatre of Harlem. ARTHUR MITCHELL—HARLEM’S BALLET TRAILBLAZER, through March 11. WALLACH ART GALLERY, Columbia University, 615 West 129th Street, New York City. 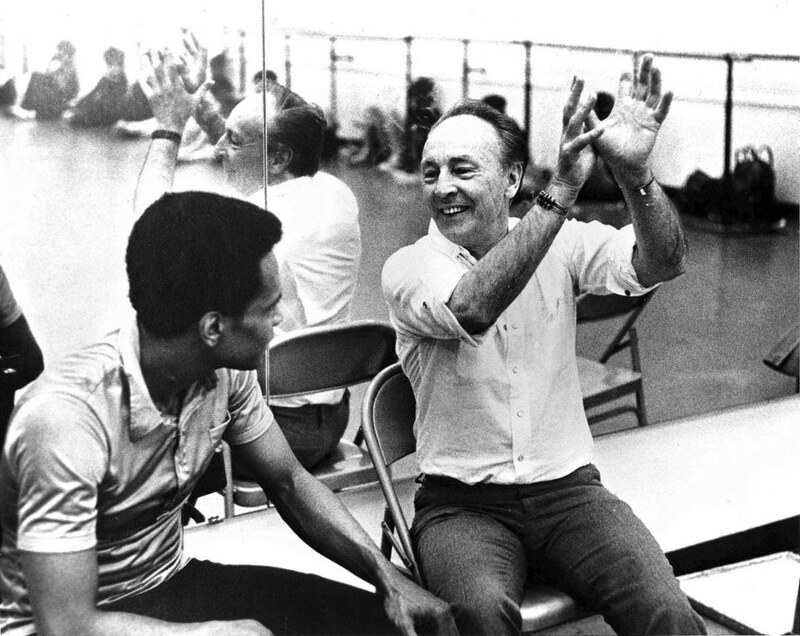 Arthur Mitchell and George Balanchine, New York City Ballet. Photographs by Martha Swope. Image credit: New York Public Library for the Performing Arts. This entry was posted in DANCE, PERFORMANCE, PHOTOGRAPHY, VIDEO and tagged Arthur Mitchell, Columbia University, Dance Theatre of Harlem, George Balanchine, Lynn Garafola, Martha Swope, New York City Ballet, Wallach Art Gallery on January 16th, 2018 by Barlo Perry. Joining Peck and company are four of their Lincoln Center neighbors, American Ballet Theatre principals Isabella Boylston, Marcelo Gomes, Cory Stearns, and James Whiteside. From Florida, Jeanette Delgado and Kleber Rebello are repping Miami City Ballet, and from Europe, Peck is importing Lauren Cuthbertson and Reece Clarke from the Royal Ballet, and Marc Moreau from the Paris Opera Ballet. It’s not all ballet, either. From the world of tap, Michelle Dorrance will be joined by her dancer Byron Tittle in Friday night’s opening number 1-2-3-4-5-6. Virgil “Lil O” Gadson (So You Think You Can Dance) also performs in the Dorrance piece, and the one-and-only Bill Irwin will dance with Peck on Saturday night. Works by George Balanchine, Kenneth MacMillan, and Justin Peck will be danced in all three performances, and Jerome Robbins’ Fancy Free will close out the show on opening night and the Sunday matinee. A live orchestra will perform from the pit, conducted by Grant Gershon. BALLET NOW, Friday and Saturday night, July 28 and 29, at 7:30 pm. Sunday afternoon, July 30, at 2 pm. DOROTHY CHANDLER PAVILION, Music Center, downtown Los Angeles. *New York City Ballet dancers include principals Taylor Stanley and Daniel Ulbricht, soloists Lauren King, Indiana Woodward, and Zachary Catazaro, and corps de ballet members Preston Chamblee, Harrison Coll, Rachel Hutsell, Claire Kretzschmar, and Lars Nelson. From top: Marc Moreau, photograph by Julien Benhamou. Byron Tittle, image credit Dorrance Dance. Tiler Peck, image credit Dance at the Music Center. This entry was posted in DANCE, MUSIC and tagged American Ballet Theatre, BalletNOW, Bill Irwin, Byron Tittle, Claire Kretzschmar, Cory Stearns, Daniel Ulbricht, Dorrance Dance, Fancy Free (Robbins), George Balanchine, Grant Gershon, Harrison Coll, Indiana Woodward, Isabella Boylston, James Whiteside, Jerome Robbins, Julien Benhamou, Justin Peck, Kenneth MacMillan, Lars Nelson, Lauren Cuthbertson, Lauren King, Marc Moreau, Marcelo Gomes, Miami City Ballet, Michelle Dorrance, New York City Ballet, Paris Opera Ballet, Preston Chamblee, Rachel Hutsell, Reece Clarke, Royal Ballet, Taylor Stanley, Tiler Peck, Virgil "Lil O" Gadson, Zachary Catazaro on July 28th, 2017 by Barlo Perry.